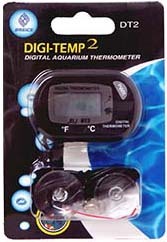 The Digi-Temp2 conveniently displays a large digital read out while discreetly mounted on the outside of your tank via included suction cup or two sided velcro tape. External temperature probe cord is 41” in length for easy placement. Compact Design: 2.25" x 1.5" x 0.5"
4. Attach suction cup or two sided velcro tape to the rear of thermometer and mount on outside of tank. 6. To turn off – hold POWER button for 3 seconds.